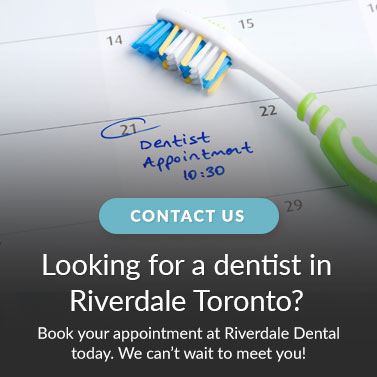 Toronto's Riverdale Dental provides dental bonding services for patients who wish to repair broken teeth, fix gaps between teeth, and brighten discoloured teeth in just one dental visit. Dental bonding is a restoration treatment for patients that are interested in closing gaps between their teeth, and repairing broken, chipped, cracked or stained teeth. Dental bonding is a procedure in which a tooth-colored composite resin material (a durable plastic material) is applied directly to the tooth, and cured with a special light, which ultimately "bonds" the material to the tooth. The tooth is then shaped and polished to blend in nicely with your natural teeth. Dental bonding is a great restoration treatment as it is has the appearance and feel of natural teeth. The bonded material is blended into different shades, toughness, and translucencies to match the natural colour of your teeth. Dental bonding can enhance your smile in as quickly as one dental visit. There is little to no removal of natural tooth enamel, preserving the health and structure of your natural tooth. Dental bonding is a less extensive treatment than other cosmetic restorations such as veneers and dental crowns.